Today, you can find several great website builders that will allow you to create your website easily and without any specific knowledge or requirement. Jimdo is one of those builders. If you are designing your website in Jimdo, use this simple guide to quickly add the WebReserv booking calendar to your Jimdo website. It’s very easy. If you don’t have a WebReserv account, you can create a free one here. If you already have a WebReserv account, login and click Website from the top menu. 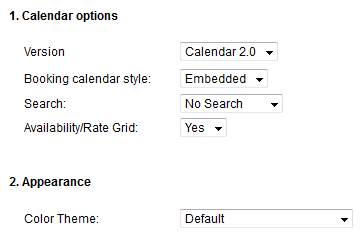 Select the version of the calendar, the calendar options and the appearance. Click here for more information about calendar options and colors. This entry was posted in Booking Calendar, Booking Calendar Integration, Website builders and tagged booking calendar in jimdo, embed calendar in Jimdo, embed webreserv, integrate webreserv, jimdo, jimdo booking calendar, jimdo website builder, lodging, recreational activities, tours, Webreserv.